On top of having effective collaboration and communication methods that enable your organization to innovate and deliver products to the market faster than the competition, you must be able to also choose the best investments that please all stakeholders. Yet, according to HBR, “only 11% of firms have the resources they need for their company’s strategic priorities,” a clear sign that the vast majority of companies are not up to speed with digital transformation. Your organization doesn’t have to be one of them. Here are a few simple tips to help you make more informed investment decisions and speed your strategic funding and resource allocation. Put an end to manual portfolio analysis. This is the cause of a lot of wasted time and money for many organizations. It’s tedious enough to search through your entire array of portfolios for necessary data, but on top of that you have to wonder about that data’s accuracy—who knows what was overlooked in the process. You need to have access to the right data, any time, and this can be achieved through automated processes. Only then will you be able to make faster decisions across different portfolios, maximizing your revenue earnings potential and expanding your market share. Stop staying yes to everything. You can’t invest in every initiative in the hopes one of them will be successful. Not only does this clog your product portfolio with lower-value initiatives, but it is simply a waste of precious resources. Rather than evaluating each new idea in a vacuum, conduct an intelligent analysis within the context of the current portfolio. With greater insight into the right ideas (and greater ability to say “no” to the bad ones) you will achieve the advantage of being able to pivot your portfolio quickly in line with rapidly changing technology and new competitors entering the market on a daily basis. Improve your ability to plan, analyze, and prioritize investments. Again, be able to do so within the context of your entire product portfolio, not in isolated siloes. With consolidated, accurate information, you won’t have to worry as much about selecting the ideal investment(s)—they will stand out to you when clearly compared to the alternatives. Further, you can create what-if scenarios according to strategy, capability, and the market to determine the right portfolio mix of projects, products, and services. Reduce costs.By prioritizing highest value investments, you will have the ability to shift spending and resources from lower-value projects. Make faster, more informed trade-off decisions.Approve and execute digital programs while optimizing resource capacity. Balance the portfolio.Achieve strategic objectives with the right combination of initiatives. 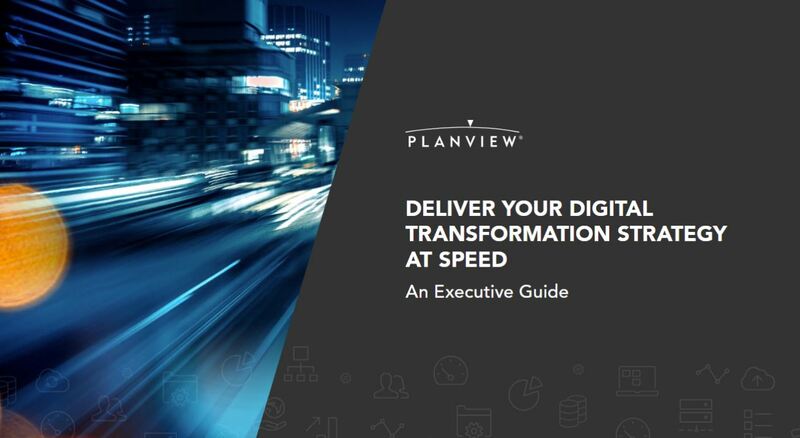 For more information on succeeding in today’s world of digital transformation, check out the eBook, “Deliver Your Digital Transformation Strategy at Speed: An Executive Guide,” and stay tuned for the next part of this series, where I will discuss how your organization can increase productivity and execute on initiatives faster.